From the point of view of global oligarchy and all forces spreading cultural decay throughout the world, the Russian Federation could not have picked a better moment to start a conflict with Ukraine. To be quite honest, it is hard to think of something that would more effectively transfer the target of most people’s hate away from them and completely save their image in Ukraine. The aggression commenced at the moment when the previous government fell, before the new government had appeared. It was essentially a moment of anarchy, a moment when well-trained nationalist street mobs ran things in the capital, a moment when key police stations and army bases were captured, when a complete nationalist coup d’état was within reach. Everything started in Crimea. It is here where Russian troops first entered the country and overthrew a government — in this case, installing the only truly pro-Russian movement of Crimea in power, a movement that during previous elections in Crimea obtained only 4% of the vote and had never led any large protest. The “president” and member of this movement, Sergei Askonov, turned out to be a known figure in organized crime in Ukraine, known as “goblin” in the “salem” gang in Ukraine. Crimea itself is a unique region and worthy of its own article, and I will try not to speak much about it. The region itself already voted to be part of Ukraine in an internationally monitored and recognized vote in 1991. It was indeed a cosmopolitan region in history, however. It was run by numerous different countries, peoples and empires — including Ukrainians, on numerous different occasions. It was a region also controlled by Greeks, although for the longest time it was controlled by the Ottoman Empire. In fact, one cannot find any trace of Russian life in Crimea until around the 18th century. Indeed, in the earliest known census of Crimea, conducted in the 16th century by Turkish explorer Evliya Chelebi Ukrainians were said to have been “4/5 of the population, mostly slaves” with the rest being Turks and Tatars. It is true that, currently, Russians are majority of Crimea, composing 58% of the population, while Ukrainians are 25% of the population and Tatars are 12%. Although it’s also important to understand that, since Soviet times, a lot of people say they are Russian when, in reality, they are Ukrainian or even Tatar, especially amongst the older generations. Also, the ethnic composition of Crimea changed hugely as a result of Stalin’s policies there, turning Russians into the strong majority during Soviet times. But to be fair, one could indeed say Russia has a claim to Crimea — a claim, albeit, no greater than Ukraine, Greece or Turkey has to it; and a claim no greater than numerous European countries have to territories outside of their borders. It is true that Crimea was transferred to Ukraine during the Soviet Union in 1954. What is not mentioned as much is that this was in direct exchange for very fertile Ukrainian lands that were equal in size to Crimea, centering around Taganrog (today in Rostov region, Russia) that were transferred to Russia from Ukraine. At the time, these Ukrainian lands were a center of Ukrainian life and Ukrainians composed over 70% of the population and historically, the lands were always part of Ukraine . This was done as it was thought it would be easier for the Ukrainian SSR to develop Crimea, which was then an area without any industry, agriculture and scarcely inhabited. This annexation was in sharp violation of the Budapest memorandum, which Ukraine signed with the US, Britain and Russia, and which guaranteed to defend the sovereignty and territorial integrity of Ukraine in exchange for Ukraine surrendering what was then the third strongest nuclear arsenal in the world. The fact that the US and Britain did absolutely nothing to stop this annexation again enraged many in Ukraine and made public opinion of them sharply decrease. Yet despite this, thankfully virtually no one in the world recognized the annexation. Combined with the complete lack of help from those who guaranteed to help Ukraine, it again appeared that things might head in a positive direction — the fact that we were completely betrayed by those who run the US and Britain gave hope that the vast majority of the population did not trust the West, and supported heading toward a third path, away from both Russia and the West (indeed, even previously liberal politicians made numerous statements hinting at that); and the fact that we gave up nuclear weapons for nothing made many seriously talk about completely rebuilding the Ukrainian army — it gave the nation a national idea, something to unite around. People even talked about seriously defeating the ever present corruption to rebuild everything. We would unite around rebuilding the country and, eventually, take back our dear Crimea — either through force or a proxy war. We couldn’t rely on the West anymore, only ourselves. By strange coincidence, Russia annexing Crimea actually made Ukrainians more nationalistic, anti-Western/liberal and united. A nationalistic, independent and deeply insulted country rising in the center of Europe? What a nightmare for global oligarchy and those very same people who run Britain and the US! The Russian Federation seemed to agree, and again, as if ordered to do, did all it could to save the image of those who run the West and turn the hate away from them. In mid-April, again with virtually perfect timing to save the image of the West, the Russian Federation started sending mercenaries into eastern Ukraine. Make no mistake: the conflict in eastern Ukraine is no different from the conflict in Syria. The vast majority of the so-called “separatists” are not local and virtually don’t speak Ukrainian; they even speak Russian with a Russian, not a Ukrainian accent. In fact, there have even been numerous humorous proofs of this: for instance, in Kharkiv, they raided an opera house, demanding that the mayor come out, thinking it was city hall. They have sophisticated arms that could only be obtained from abroad. It is definitely true that, like in Syria, the terrorists have the support of some of the local population. 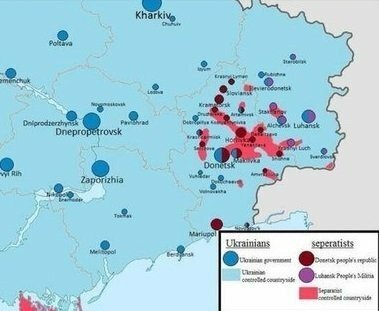 In Ukraine they have support of a large part of the ethnic Russian minority (in some cases reaching 30%), and in Syria they have around the same support from the local Sunni population. Yet this is still a small minority even in eastern Ukraine. In reality, outside of a few regions, eastern Ukraine remains just as peaceful as Western Ukraine; and perhaps even more peaceful. Points of unrest in Eastern Ukraine in red. The vast majority of the region has been untouched by any violence. It’s important for a moment to examine the Russian Federation’s policies inside Ukraine i leading up to this. There seems to exist a certain misconception that in Ukraine, Russia fights liberalism, globalism, and etc. -, while every other force brings Ukraine closer to it. Unfortunately, the Russian Federation in Ukraine only fights supporters of Ukrainian identity, leaving Western agents untouched. When the first gay-parade took place in Kyiv, first attempted in May 2012 and then conducted in 2013 — both times sanctioned by the same government that the Russian Federation still recognizes as the legitimate government of Ukraine to this day and gave millions of dollars to support — it was Ukrainian nationalists who went and attacked it. And it was pro-Russian media channels at the time like “Inter” that most heavily criticized “Ukrainian fascists” for their deeds. A while ago, when the Kyiv-Mohyla University tried to house, quite literally, an exhibition on completely degenerate liberal art — the first of its kind in Ukraine — with attacks on the family, Christianity and the heart of Ukrainian identity, it was Ukrainian nationalists who raided the exhibition, destroyed it, and even met with the head of the University and eventually succeeded in banning the group who supported it. They were later called “neo-Nazis”, “fascists”, etc. by Russian-sponsored groups in the media. In fall 2013, Ukrainian nationalists brought a Celtic cross and a Ukrainian nationalist flag to a football match. Nobody in the stands cared; in fact, the “ultras” who brought the symbols were adored by the rest of the fans. It was not a big deal in Ukraine, because all football fans in Ukraine are nationalists, except for one (now defunct, since winter 2013) club: FC Arsenal Kyiv, who view themselves as anti-fascists. This group, whose anti-fascist fans were and are controlled by leaders directly financed by the Russian Federation, was most usually known for attacking innocent people with patriotic symbols on them or defending homosexual demonstrations. Yet, after the match, their leader, member of “anti-fascist” trade unions in Ukraine funded by the Russian Federation —also a member of a so-called “anti-racist” and “anti-homophobic” commission at UEFA called FARE — immediately told UEFA of “Ukrainian fascists.” An international scandal ensued, as Ukraine was originally banned from having any fans present at its next home game. 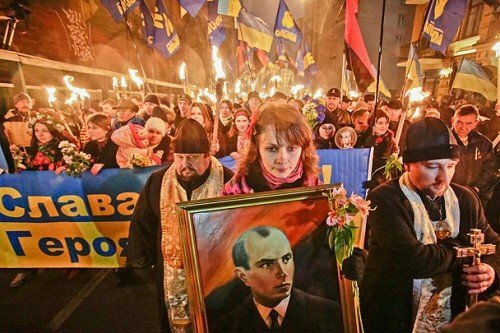 While the fight against pro-family, patriotic “Ukrainian fascists” inside Ukraine is heavily financed by the Kremlin, the cultural Marxism coming from the West is completely untouched by the very same Kremlin. It is only Ukrainian nationalists who openly oppose Western funds, embassies and grants in Ukraine which aim at spreading every value that has destroyed the West. It is only Ukrainian nationalist parties who openly make statements against them and openly fight them on the streets. The Russian embassy, which actively engages in an information war against Ukrainian nationalists, saying they are “dangerous to society” — has never issued even one statement on the destructiveness of such Western funds, embassies and grants, in Ukraine. They have never been even slightly countered by the Russian Federation in Ukraine and, in fact, when it comes to stopping the “heroization of Nazism” in Ukraine, the Russian Federation actively works with such Western funds, embassies and grants. The first protest of the Russia-funded Eurasian Youth Movement in Ukraine discredited it in the heads of virtually all Ukrainians. One would think that a movement claiming to be fighting global liberalism would, in the very least, destroy the office of a George Soros-sponsored liberal fund in Ukraine; or at least spread some anti-liberal leaflets. Instead, it climbed to the highest peak in Ukraine, the Hoverla mountain, where it destroyed yet more traces of the omnipotent Nazism — this time, the state coat of arms of Ukraine, the “Tryzub” (which, of course, it calls a “symbol of Nazism”), and also a copy of the first Ukrainian constitution. Not only did it do that, it also renamed the mountain from Hoverla to “Stalin’s Mountain” the entire process. How did the Russian ambassador react? “It doesn’t matter, it was just an unsuccessful joke.” Really? Soon after, the Israeli wing of the Eurasian Youth Movement ripped apart a Ukrainian flag in Tel-Aviv to protest “Ukrainian nazism”. The protest was led by Avigdor Eskin, an Israeli Zionist and good friend of Alexander Dugin. 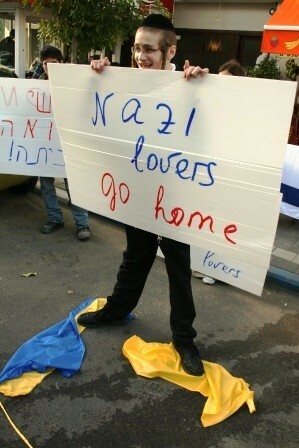 Zionist Eurasianists fight Ukrainian Nazism in Tel-Aviv. It should be mentioned, however, that despite these policies, Ukrainians think very warmly of Russians. This is no less true in the so-called “heart of Ukrainian Nazism,” Western Ukraine. Indeed, in dozens of major cities of Western Ukraine, one can find monuments to Russian writers like Pushkin; the city of Lviv in early 2014 even “spoke Russian for a day” to show it has no animosity to anything Russian. One who doesn’t speak Ukrainian can merely check the warm and hospitable reactions of typical people in Lviv, the so-called heart of Ukrainian Nazism, when asked in Russian by people pretending they were from Moscow where to find the local Russian Orthodox Church (see here), recorded by a hidden camera. One of the leading and largest nationalist organizations in the Right Sector movement (a united front of nationalist movements created during the Maidan protests), the Patriot of Ukraine movement, even proposed that nationalist Ukraine should aim to form a confederation with nationalist Russia and Belarus a few years ago at a meeting with Russian nationalists in Kyiv. Perhaps the only thing the current Kremlin hates almost as much as Ukrainians are ethnic Russians. Ethnic Russians have been driven out of the Caucuses region, as well as Moscow. In fact, only a few weeks ago, in mid-May, mass anti-immigration riots of Russian nationalists erupted in the city of Pushkino after a Russian football fan was murdered by an Armenian immigrant. 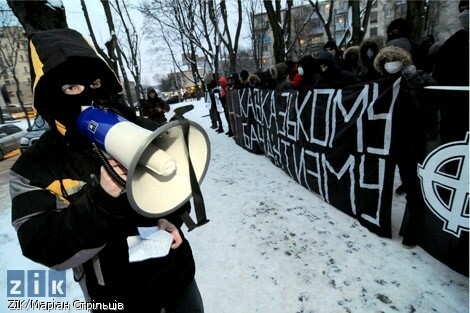 The demonstrators were treated harshly by police and there was a complete blackout by the Russian media. Quite naturally, Eurasians (supporters of Dugin) pretended nothing happened. Crimes against ethnic Russians from immigrants from the Caucasus region are very common in the modern day Russian Federation. The last major nationalist explosion inside the Russian Federation came in December 2010, when again a young football fan was stabbed by an immigrant — who himself was shortly after cleared and released by police. Ukrainian nationalists immediately responded by conducting numerous rallies of solidarity with their repressed Russian brothers. Yet even worse is the fact that now the influx of immigrants comes from countries from outside the former Soviet Union, such as African countries, China and so forth. One who thinks Paris is multicultural has not been to Moscow. Today, much like in the West with White people, in the Russian Federation if two people are in a fight — an ethnic Russian a non-Slav, it will always be the ethnic Russian attacked by the media and charged. Numerous examples of this exist. In fact, the modern day Russian Federation even created a new word that translates into English as “Russian” when describing nationalities — the traditional word Russky, has been completely replaced in all state media by the fake word “Rossiyanyn” which denotes anyone living in Russia, regardless of nationality or birth place. Needless to say, virtually every speech made by Russian politicians interpreted as being nationalistic by Western dissidents actually used the word “Rossiyanyn” not “Russky”, and actually has quite negative , anti-nationalist connotations. Beyond any doubt, ethnic Russians are treated far better in Ukraine than in the Russian Federation. Continuing their tradition of promoting friendly relations with Russkys, Ukrainian nationalists during the recent protests in Ukraine even created special Russian legions. Indeed, the Right Sector itself created a special battalion for comrades from Russia to join and defend Slavic Ukraine, which has become quite popular and is quite active. There has also been a special committee created by independent nationalists from the Maidan named RUNA (which means “Rune” in Ukrainian and Russian, and stands for Russian-Ukrainian Nationalist Association) aimed at facilitating co-operation. Long before the current events began, an ethnic Russian member and regional leader of the Ukrainian nationalist Svoboda party said it best: “You won’t find even one ethnic Russian amongst the leaders of Kremlin-funded Russian movements in Ukraine” — words that are quite interesting and accurate. Every pro-Russian force in Ukraine is financed from the Russian Federation — from Jewish millionaires like Mykailo Dobkin, to political parties united around organized crime like the former ruling Party of the Regions. Ideologically, these groups are liberal and (surprisingly, perhaps) they are pro-EU — for example, the Party of the Regions signed many laws needed to get closer to the EU before backing out of the Association agreement, which the current government also backed out of and obtained a lot of money from Russia; the same with “anti-Fascist” groups. They merely wish there was less presence of the Ukrainian language and Ukrainian identity in Ukraine. A gay parade — no problem, so long as the signs held are in Russian. Their enemy is not Ukrainian liberals, Western agents and so forth — their enemies are Ukrainian nationalists.